Undoubtedly, the travel landscape has changed with the rise of technology. Once upon a time, travelers used to look through postcards and visit the brick and mortar locations of travel agency for ideas regarding their next vacation destination. However, today the aspiring travelers, specifically the young generation turn towards social media to plan their next getaway. In fact, a recent study proves that for millennials, the “instagrammability” of a location is the most important factor when planning a vacation. Winfield has conducted an analysis of Instagram hashtags that shows Central Park to be the most trending hashtag of 2018. According to the report, Central Park in New York City comes close to 6 million hashtags. Eifel Tower of Paris follows the popular United States travel destination while the Times Square (New York City), Big Ben (London), and Grand Canyon (Arizona) also make it to the top ten-travel destination. 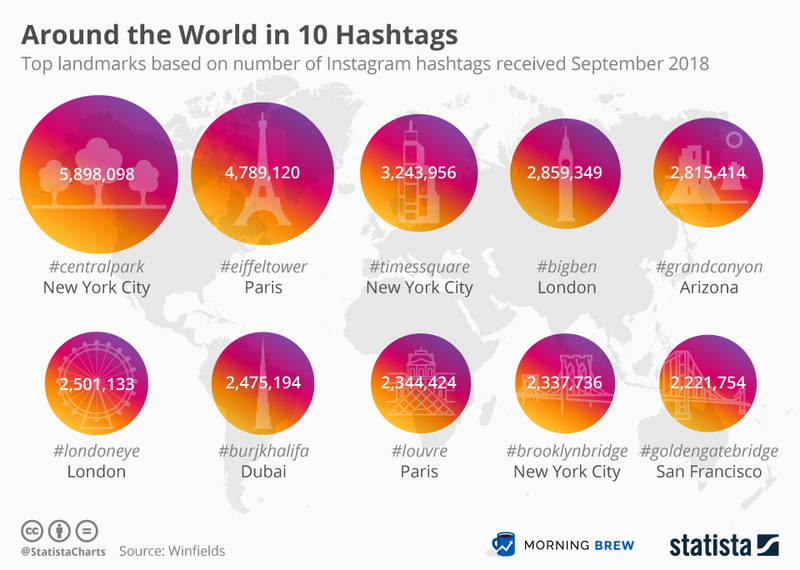 Surprisingly, the landmarks of the United States, United Kingdom, and France dominate the top ten Instagram hashtag as the most desirable vacation spots. However, Burj Khalifa – the world’s tallest man-made structure located in UAE is the only destination from outside these demographics to make it to the list. Take a look at the infographic below and select your next vacation spot from these top ten trending hashtags.